One engraving line is provided for an Emergency Contact Number. Georgia state code 31-39-6.1 provides that Georgia residents with a Do Not Resuscitate order signed by their attending physician may wear a bracelet to indicate that a DNR order is in effect. In 2016 the statute was changed to allow a metal bracelet rather than a paper bracelet with an orange background. The back of the bracelet must specify the patient's name, the name of the physician who issued the DNR order, the physician's telephone number, and the date of the DNR order. The surgical stainless bracelet displays the internationally recognized Staff of Aesculapius medical symbol on the front along with the words 'Georgia Do Not Resuscitate Order'. The patient’s full Name will be engraved on the first line of the back of the bracelet, along with the name and phone number of the attending physician, and the date of the DNR order. There is one additional line available for an emergency contact phone number, if desired. All backside engraving is included in the price shown. 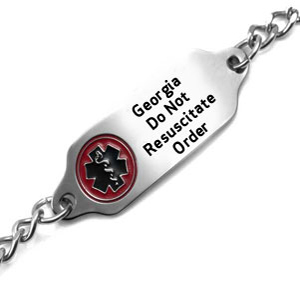 To issue a Georgia DNR bracelet, we must first receive a copy of your Do Not Resuscitate order signed by your attending physician. You can either scan the signed document and send it to us by email (CustomerService@StickyJ.com), Fax it to us at 727-490-5446, or mail it to: Customer Service, StickyJ Medical ID – DNR, 10801 Endeavour Way Unit B, Seminole, FL 33777. If you have any questions, please call us at 727-823-9500.